Peter Sydney Ernest Lawford (born Peter Sydney Ernest Aylen; September 7, 1923 – December 24, 1984) was an English-born American actor and singer. He was born in London. He was a member of the "Rat Pack" along with Dean Martin. He was married to Patricia Kennedy. Lawford then became the brother-in-law to President John F. Kennedy. He had four children; including Christopher. 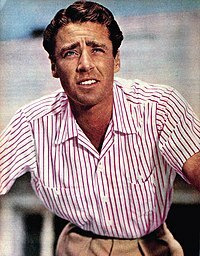 From the 1940s to the 1960s, he had a strong role in popular culture and starred in a number of popular movies. Lawford died from cardiac arrest caused by renal failure and liver failure in Los Angeles, California, aged 61. This page was last changed on 5 September 2018, at 20:22.